Valid till 24 February 2019. 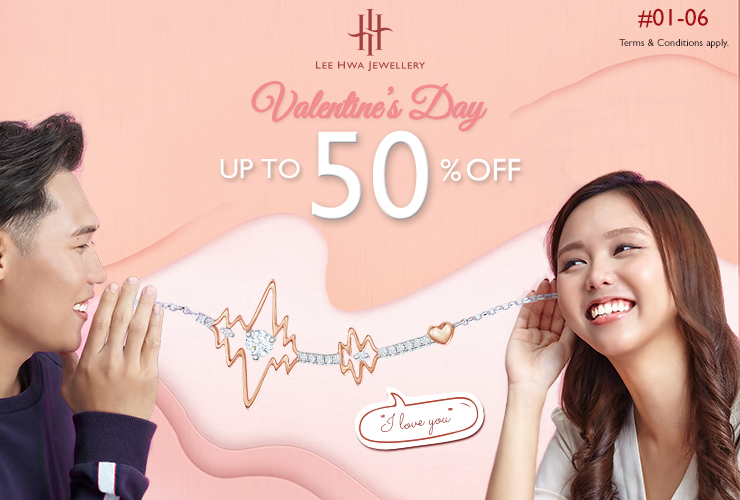 Inspired by true love that transcends age and time, Lee Hwa Jewellery unveils a collection of timeless jewellery pieces celebrating glorious love this Valentine’s Day. Express the universal language of love beautifully to your loved ones – be it your sister, your best friend, your mother, or your partner - with dazzling and exclusive stunners that will fill their hearts with joy. Available at Causeway Point, #01-06. • Additional 10% off for UOB, OCBC, Maybank and Amex Cardmembers. Not valid for Niessing, Niessing Solitaire, Fancy Diamonds, Accessories, Fashion Indulgence and standard chains. • Promotion is valid on non-branded lines only. • Promotion is non-accumulative and cannot be exchanged for cash. • Aspial-Lee Hwa Jewellery reserves the right to amend to any policies without prior notice.